This was a favorite of ours at a recent visit to a restaurant that has really delicious pies. This garlic toast tastes much like Marie Callendar's garlic bread. In a small saucepan melt butter, oil, garlic, paprika, salt, basil, and parsley until blend. Heat oven to 400 and spread melted herb mixture on sliced bread and bake until the bread is just turning golden remove from oven and layer with mozzarella and parmesan on top. Place bake in the oven until cheeses are melted and serve warm. Prepared Bread is great served on top of a steaming bowl of French Onion Soup. Great recipe! I have a simple easy to make version using only minced garlic and olive oil. Good for vegans and vegetarians. 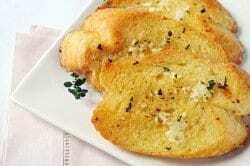 Another Great garlic toast recipe! Like all the others its fantastic!